The outside lanes of I-264 east, also known as the I-264 east collector-distributor road (CD road), will close at the I-64 interchange the night of Saturday, April 6. The same closure will reoccur nightly for approximately one week beginning Wednesday, April 10. The nightly closures will allow crews to set girders over the roadway for construction of the new I-64 west ramp to I-264 east. To bypass the closure, signs will detour traffic from the CD road to I-64 east and the Indian River Road exit. Vehicles will be directed back to I-64 west from Indian River Road and to the exit for I-264 east and Newtown Road. 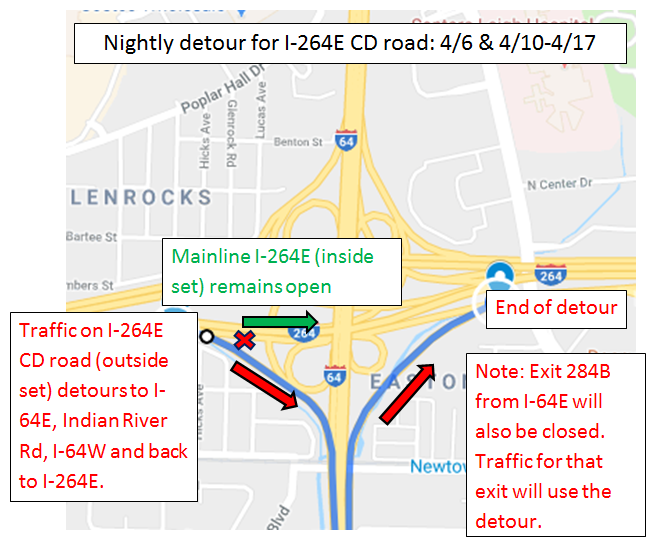 Drivers will still be able to access Exit 15 for Newtown Road using this detour. Motorists traveling I-264 east toward Virginia Beach who are not destined for the Newtown Road exit are urged to remain on the I-264 east mainline lanes (inside set) to avoid the detour on the CD road. Exit 284B from I-64 east will also be closed during this operation. Traffic for that exit will also be detoured to Indian River Road. Saturday, April 6: 11 p.m. to 8 a.m.
Wednesday, April 10, and Thursday, April 11: 10 p.m. to 5 a.m.
Friday, April 12: 11 p.m. to 7 a.m.
Saturday, April 13: 11 p.m. to 8 a.m.
Sunday, April 14, to Wednesday, April 17: 10 p.m. to 5 a.m.
For more information on the improvements coming to the I-64/I-264 Interchange and the Newtown and Witchduck ramps, visit www.i64i264improvements.org . Subscribe here for updates and travel alerts.